Europe Trip - Day 2 — Geoff Wood, coworking guy. Our flight to London Stansted wasn't until early evening so we had the chance to get out and do a couple our favorite things around Washington, DC. A couple metro stops down the line from Matt's apartment is the National Zoo so we popped in for a visit. We usually try to hit up a zoo on vacation when given the chance and the National Zoo is a favorite for a couple reasons(1): excellent lemonade and free admission. After the zoo we took a quick trip further down the Red Line to DuPont Circle for some window shopping(2) and a drink at Kramer Books (a bookstore/bar that was famous for having sold Monica a book she gave to Bill and their refusal to cooperate with the Starr investigation). 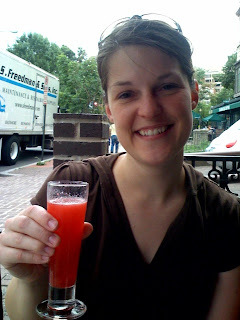 Hope and I (along with Matt and Jane) had drinks at Kramer books back in 2004 the night before I proposed. That evening after a not-so-quick $50 taxi ride to Dulles we checked in for a all-business class flight on Maxjet Airlines. Like good travelers, we heeded the TSA warning and arrived two hours early for our international travel. Thankfully, Maxjet partnered with NWA on their lounge at Dulles and we got to wait in style. The flight was excellent as expected. We were spoiled when American Airlines upgraded us to business class for the flight in 2005 and found that the coach trip back was really lacking. We assumed Maxjet would be a step below American (it certainly was below in prices) but they really did it up right. We started the flight with champagne and were well watered and fed throughout. It almost feels like you're missing out if you go to sleep (my preferred way to fly). Instead I passed the time watching episodes of "Friends", "How I Met Your Mother" and about half of the movie "Night at the Museum".